The Author is one of the founders of the Men's Movement. 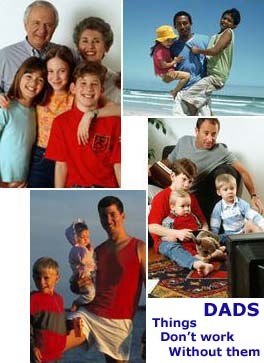 The website of Fathers for Life is in defence of men and fathers. It promotes fathers within, not without families. Deadbeat fathers are a very small, minuscule minority and not representative of all men, just as deadbeat mothers are not representative of all mothers or women. However, we hear incessantly about deadbeat or violent fathers and men, while feminist activists and the feminist-dominated media sweep the issue of deadbeat mothers and far greater numbers of violent women in all cases of domestic violence (esp. when it comes to violence against children) under the carpet. Our website illustrates how the all-pervasive vilification of men, of fathers and of the traditional nuclear family grew out of the systematic implementation of the international agenda for the planned destruction of the family. This site contains news and commentaries pertaining to fatherhood, fatherlessness, family issues, gender politics and the planned deconstruction of our society. The news items and other information found on this website reflect a conservative perspective and can be disturbing to liberals. 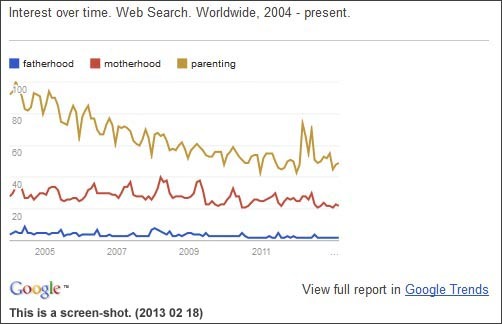 Click on the image, or on this link, to see more details and a view of the latest data on these and other perceptions through Google Trends. Pointers on how to navigate this website. The website of Fathers for Life contains a large collection of information, statistics, commentaries and references pertaining to the traditional nuclear family in the context of society and its evolution. Fathers for Life is best looked at as an encyclopedia of the family and the agenda of its enemies. The search tools available at this website and on the Net. Tips on how to search this website. The old table of contents is no longer being maintained but still provides access to the web pages it provided access to over the years. The Table of Contents serves to illustrate, by means of a fairly large sample of articles, what variety of information is available at Fathers for Life. It will never be exhaustive (the site map comes much closer to being that), as it would become far too large. Given the search tools that are available at Fathers for Life and through the search engines accessible on the Internet, there is no need to maintain such a massive table of contents.